Radiation dose is a measurement of how much energy is deposited into a material from a source of radiation (see what is radiation). It is measured in units called rads. Dose gives a physical explanation of energy deposited in mass but does not give a good description of the effects of that energy deposited into a living organism. For this, we need something called the dose equivalent. Did you know? 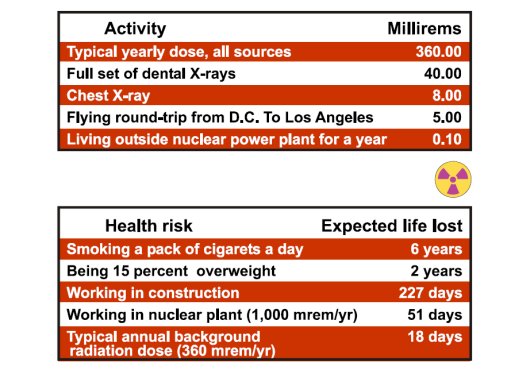 You get 50 times more radioactive dose in a single flight from D.C. to L.A. than you get from living next to a nuclear power plant for a whole year. Great question. Different types of radiation have different effects on the body because of the way they deposit their energy. To meaningfully interpret different doses of radiation, we modify a given dose by something called a quality factor that depends on the type of radiation. The higher the quality factor, the more dangerous an encounter with radiation may be. A table of quality factors is shown below. Dose equivalent is defined as H = D*Q, where D is the dose and Q is the quality factor taken from the table above. Dose equivalent is supposed to approximate the biological effect of different types of radiation so the Sv (or rem) is used as the unit to regulate the amount of dose an individual receives, rather than rads. How much dose equivalent is safe? When it comes to judging safety of radiation, we run into a lot of uncertainty. The only real data we have on the health effects of radiation come from the victims of the nuclear bombings in Japan and from victims of other very high-radiation accidents. So we know quite well that receiving a very large dose in a very short time (hours or days) is very dangerous. In fact, 50% of people receiving over 300 REM in a short time will die within 30 days of severe radiation poisoning. To get such a dose, you would have to stand very close (with no shielding) to a nuclear chain reaction or some other highly intense radiation source, such as a freshly spent fuel rod. So, obviously, a lot of radiation is very bad. Less extreme doses can still have serious health effects. Radioactive particles stream through cells, breaking up their DNA and killing them, or causing them to become cancerous. Our skin provides good defense against much of the radiation we encounter on a daily basis. But when ingested, or uptaken into the body (like in the thyroid), very small amounts of radioactive material can cause serious illness and death. An example of this would be the terrible poisoning of Alexander Litvinenko [wikipedia]. As a result of the Chernobyl disaster, many cases of thyroid cancer were reported (thankfully, these were mostly treatable). Worse, you cannot smell or see radiation. It’s nearly undetectable without special instruments. These are the reasons many people are terrified of radiation. Things get much more hazy when dealing with very low levels of radiation. Regulators often assume the linear no-threshold model, which says that any amount of radiation at any level is bad. This conservative model tells us to stay away from radiation as much as possible. By the way, other models, such as hormesis [wikipedia], suggest that in low levels, radiation is actually beneficial. There is no scientific consensus on this, so we just say better safe than sorry and minimize our radiation exposure. 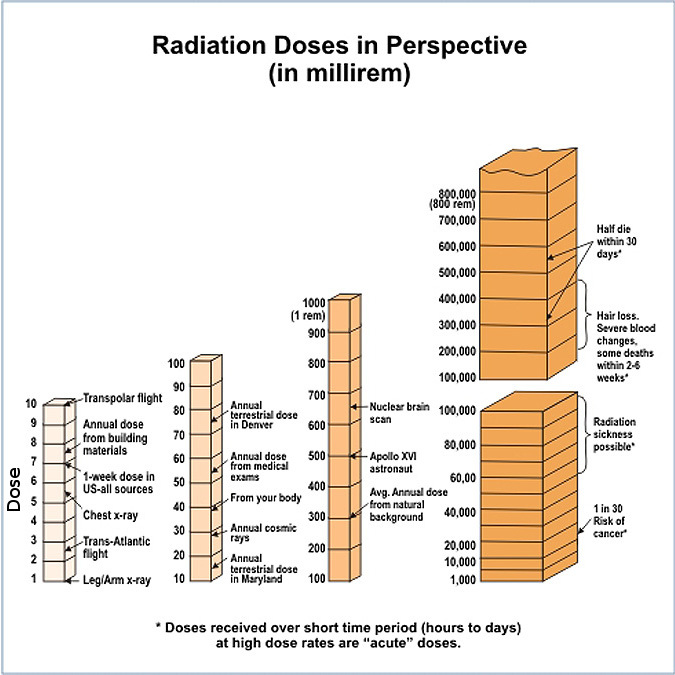 To help you determine how much radiation you are OK with, you first have to know how much radiation you already get. We provide the following data. Figure 1. Dose equivalences from several activities and health risks of other activities. Figure 2. A logarithmic plot of doses you get from various sources. As you can see, you get radiation from many things you may not expect. Flying brings you outside the protection of many layers of atmosphere that shield us from cosmic radiation from the stars. Naturally radioactive building materials give more dose than chest X-rays. Living near a nuclear power plant doesn’t even register on the graph. How do you minimize your dose around a radioactive source? Time – Limit the time that you are located in a radiation area. Less time means less absorbed dose for a given source. Distance – The more distance that is put between you and the source decreases the intensity of the exposure from that source. Shielding – Shielding is quite simply putting material between you and the source to lower intensity of the radiation. Examples include concrete walls or lead but generally the more material the better.